good alignment when I can't make out the north star due to city lights and the comet itself is not naked eye visible nor is much of anything in its local star background at this location. So I decided to just get out the old trusty level and set the mount zero position just using gravity with the level indicating where the proper zero location of the mount for polar alignment was located. Then to get a polar alignment, all that was necessary was to manually move the mount until Polaris showed up in the camera viewfinder. 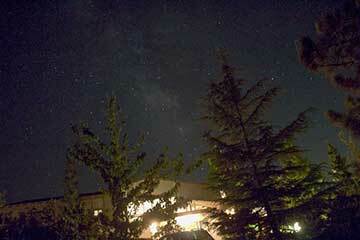 I couldn't see Polaris myself, but with the camera and scope, it was quickly found. There is still the uncertainty of whether the mechanical fixtures on the mount that were used with the level were actually machined and aligned so that the telescope optical axis actually is aligned with the mount polar axis. The mount has a polar alignment scope built into the mount but I didn't believe I could spot Polaris through it. Actually, I sort of forgot to try it out, but in retrospect it still seems it would not have worked with the city lights, but the camera worked very well. As it turns out there seems to be a little misalignment because I still found so star trails and tracking error, but I am getting ahead of the story. So, after one star initial alignment and one quick slew to Jupiter just to check out it that would be ok, it was time to go after the comet. My initial lookup of the comet parameters used RA = 15 18 10 and Dec = +63 48 36. 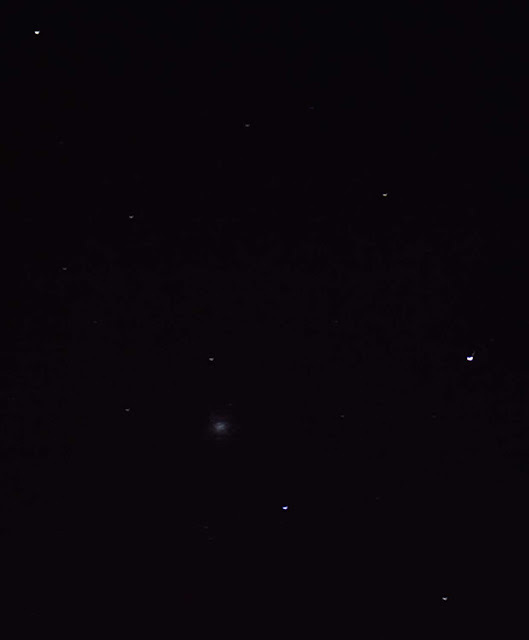 The image below is a magnified section of the 240 second exposure. I was quite excited to see at least a little fuzzy blob of white, in the blue circle, in the camera frame even though at the time I didn't know for sure if that was the actual comet 41P. Is this little smudge of light in this expanded portion of a 240 second exposure the comet 41P? So, since I have been fooled many times before by a scope with enough misalignment error that the goto function was off by several degrees, I posted the image to Astrometry.net to find the actual location that the camera was looking at. Hooray, the center of the camera frame is just a couple of arc minutes off from the desired location. Check out the screenshot below. So things are looking up. 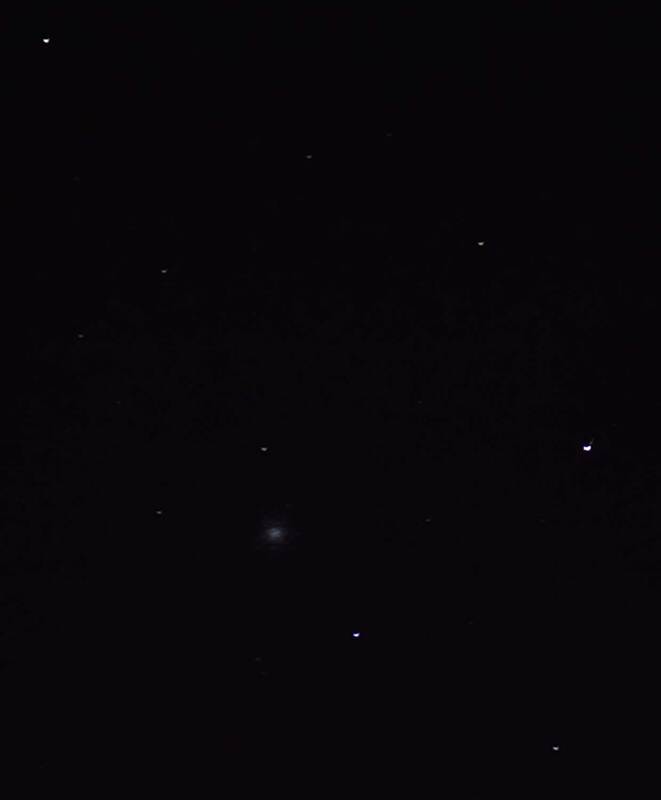 The alignment seemed to be good enough that the target comet was within the camera field of view and the tracking, though not perfect, seemed to be good enough for this 240 second exposure. I could have spent more time on getting better tracking but I didn't want to the clouds to appear and stop all observing, which they did about an hour later. 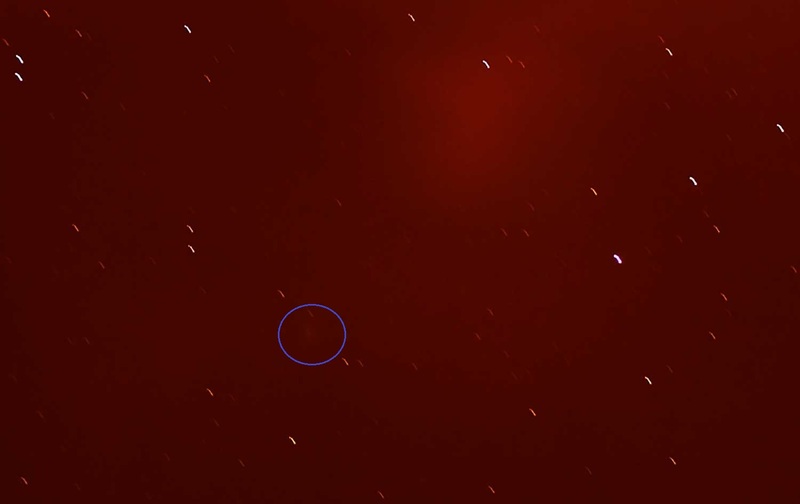 Now if we were to know the RA and Dec of the actual fuzzy blob of light we can see how well it matches up with the predicted location of 41P. 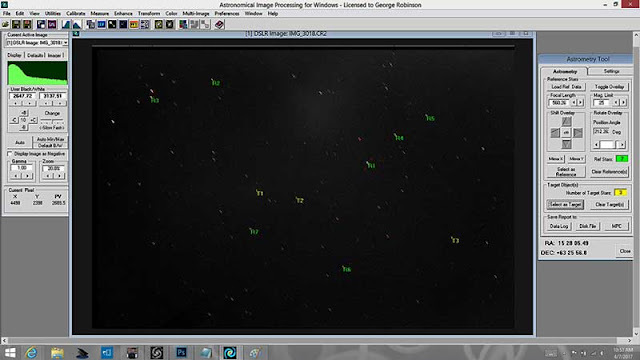 AIP4WIN is a good tool that this resident astronomer uses to overlay catalog star locations on top of selected actual stars in the image and then let the software calculate the best match and RA and Dec of other target objects. 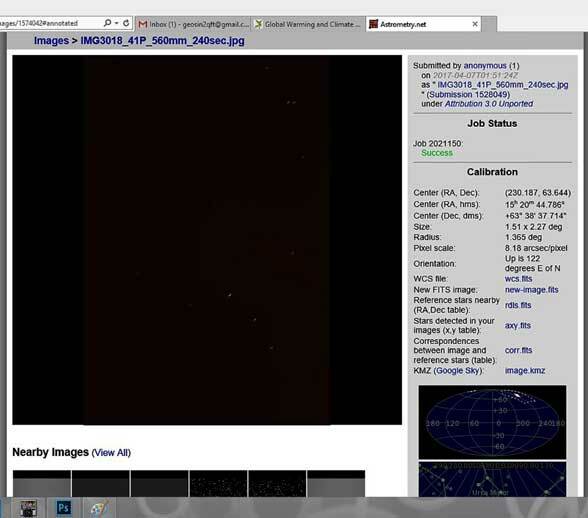 Check out the screen shot below which shows my arbitrary selection of seven reference stars and three target locations. 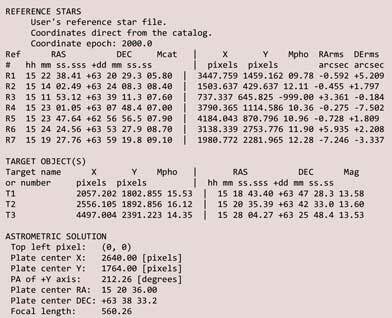 The catalog stars fit right on top of the observed stars even though some of the imaged stars had some star trailing issues. Target T1 was the placed right on top of the fuzzy blob. T2 was placed at the predicted location of 41P at 11:00, just I looked up only 1.5 hours after the image was taken at 9:32PM. Darn, I forgot to keep better track of when I looked up the comet's predicted location and so I am reduced to just using some values after the fact. But we know the comet is moving across the sky and changes in its location can be seen to change quite a bit in just the course of one day. The third target, T3, represents the 41P location just 12 hours after T2. For all of you analysts out there, I have posted the AIP4WIN report for the reference stars and target objects below. Resident Astronomer Peggy reminded me of another comet that has just been observed to be flaring quite a bit brighter than normal now and can even be observed with binoculars, Check out PanSTARRS (C/215 ER61) in Aquarius. To bad it seems to want to show up only early in the morning. Boy, seeing how dim and small that image is makes we sort of long for the bigger scope that was traded in so that the smaller and more light weight 80mm scope could be picked up. Oh well, I'm just getting more and more into ease of setting up than in having a bigger aperture.